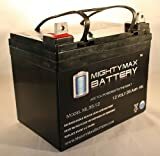 Mighty Max 12 volt 35Ah valve regulated sealed lead acid batteries are maintenance free, rugged and economical. Mighty Max SLA batteries are utilized in a wide variety of applications including electric vehicles, wheelchairs, scooters, UPS backups, computer systems, industrial and medical equipment and more. Delivering power when you need it, the ML35-12 uses a state of the art, heavy-duty, calcium-alloy grid that provides exceptional performance and service life in both float and cyclic applications.